Living in Seattle means we have to be comfortable with our northern Neighbors in Canada. 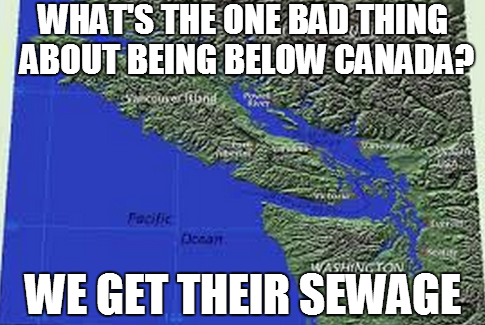 Unfortunately, they have been dumping raw sewage into the Strait of Juan de Fuca, which leads directly into Puget Sound. For the most part, Canadians are the perfect neighbor, friendly, quite, and helpful, but no one wants their neighbor’s garbage. Sewage backup cleanup is bad enough when it is your own black water. After some serious negotiations between U.S. and Canadian lawmakers, including a &780million proposal to move the sewage plant, Christy Clark, the British Columbia Premier has come to tentative terms with our Governor Jay Inslee. The sewage processing plant in Victoria will begin treating the hazardous water. 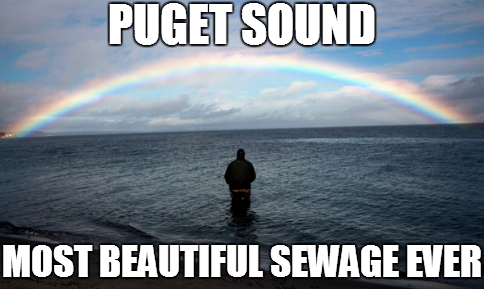 Unfortunately, that means Canadian sewage will still find its way into Pugent Sound, but at least it will be less harmful. It is a start in the correct direction, but there is still much work to be done. What are the Hazards of Sewage? Any time you find returning water on your property, you need to leave it to sewage backup Seattle professionals the worst sewage hazards are E. Coli. Water damage, mold, and death. If you come in contact with category 3 water or digest grey water, you should get to the hospital with all haste because harmful bacteria will be working their way into your body. If not treated promptly, you may die. As with all floods, professional water removal services are needed. If you turn this into a DIY job, you are risking your health and the well-being of your home because water will sink into the walls and rot your support beams. Once it embeds itself behind your dry wall and carpets, mold grows, which presents further health risks mostly with respiratory problems. Knowing this, you should not only stay out of Puget Sound, but take action to keep sewer water away from the area. Any time you have a toilet overflow or a pipe burst, you need water damage restoration services from sewage backup Seattle specialists to avoid all these health risks. What can I do to Save Puget Sound? Law makers are always accessible to citizens via mail, and many can be reached via social media. Let our senators and representatives know how important this issue is. It is important to understand there is a limited amount of time and money that can be spent on an issue, but if the community bands together, a larger portion of resources will be committed to cleaning the Puget Sound. Washington does not have sewage backup Seattle professionals the size of Jaegers from Pacific Rim, so the process of sanitizing that body of water will take a considerable amount of time, even after the dumping stops. Clark was very mum on the conditions, saying little more than her intentions to ensure the Victoria sewage facility adheres to the treatment plan. There is no time schedule set forth and little is known about the treatment that will be used. What is known is that Puget Sound will be healthier, one day. This is yet another reason that pressure needs to be applied here. While you can’t fix Puget Sound in a day, sewage backup Seattle specialists can repair houses that fast. Whether dealing with raw sewage on a large scale or smaller one, leave it to the professionals and remain a safe distance away from it.